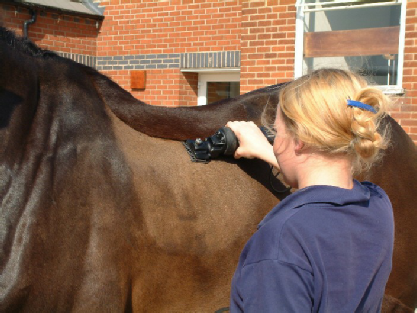 This is a major breakthrough for anyone using Cattle Clippers, Dog Clippers, Horse Clippers and Sheep Shears. 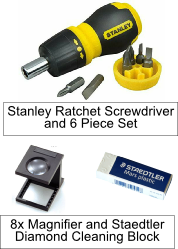 You’ll be amazed at how simple it is to sharpen them and how much money you’ll save! 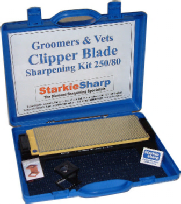 You can save hundreds (or some people even thousands) of pounds over the life of one of these Clippers Blade Sharpening Kits for an outlay of only £187.00 + VAT or even less if you choose the smaller kit. Clipper Blade Sharpening with our Kit is so easy and saves an enormous amount of money against sending blades away for sharpening. 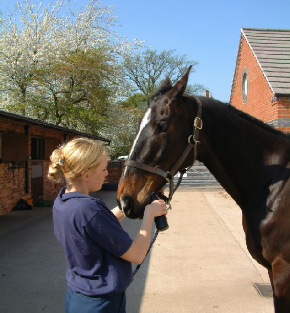 It prolongs blade life by up to 10 times too, when compared to conventional grinding. The trouble is, conventional grinding can take off too much metal wearing your blades out fast. When you do the job in house you’re only taking a minute amount of metal off which means your blades last much, much longer. You don’t have to send them away either saving that inconvenience and it means you don’t need so many back up sets too! 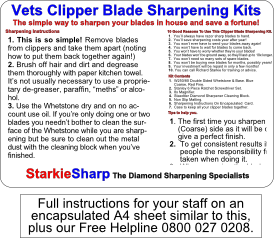 I remember one of our Dog Groomer customers at CRUFTS some years ago, telling me that since they bought one of these kits four years before, they hadn’t bought any new blades and they didn’t expect to buy any new blades for four years to come! 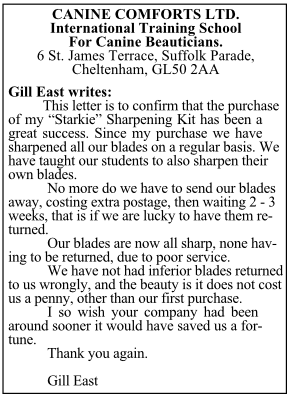 You can imagine why I’m not ‘flavour of the month’ with blade manufacturers! But for you it’s a win, win, win situation; big savings and always having razor sharp blades to hand. Each kit comes with full instructions and a sturdy case which will keep all your blades together in one place. 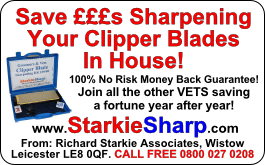 hundreds of pounds in the first two years of using their StarkieSharp Clipper Blade Sharpening Kit. Both of the kits below will do the job equally well, the only difference being in their surface area. The bigger the area the easier it is to sharpen purely because there is more room to move the blades around. 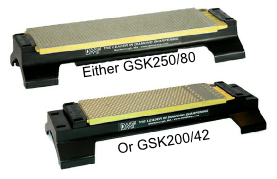 The GSK 250/80 has almost twice the surface area of the smaller one and when customers find out just how good the system is they often wish they’d gone for the bigger one first time! 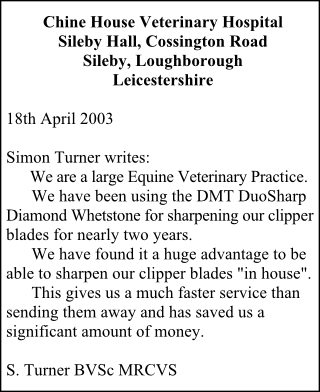 Obviously it will last twice as long too before it needs replacing and one sharpening service which used these exclusively told us they’d sharpened around 6,000 sets of Dog Clipper blades on it! Clipper Blade Sharpening In House.